Obvious Child deserves credit for dealing with abortion in an entirely credible way — presuming you’re talking about the abortion of a privileged New York woman who lives in trendy Brooklyn and is trying to make her way into the competitive world of stand-up comedy. Director Gillian Robespierre makes her debut with a romantic comedy built around an aspiring comedian you’ll either find funny or annoying. I leaned toward the latter view, which undoubtedly colored my opinion about this widely praised indie. Jenny Slate’s Donna Stern works at a bookstore that’s going out of business and performs her personalized comic routines in a low-grade nightspot. On stage, Donna talks about herself in ways that mix self-deprecation and hostility. She’s one of those comics who giggles at her own jokes, which, as I’ve said, didn’t do much to move the needle on my laugh meter. And that would have been fine had the movie recognized that Donna may be marking time before she gets on with her “real” life. I’m not sure it does. Slate (familiar from TV’s Bob’s Burgers, Parks and Recreation and Kroll Show) doesn’t do much to take her character beneath the surface. Donna’s a self-absorbed young woman with divorced parents: an artsy-fartsy, puppeteer father (Richard Kind) and a strictly business mom (Polly Draper). Early on, Donna is dumped by her boyfriend (Paul Briganti). He’s put off by the fact that she discusses their relationship on stage, suggesting an under-explored and interesting subject: What happens when someone uses someone else’s life as material? A distraught Donna tries to rebound with a drunken one-night stand. She sleeps with Max (Jake Lacy), a WASPy guy who happens to find her funny and engaging, and who’s also consistently nice. A night that might have fizzled into memory persists when Donna discovers that she’s pregnant. She’s smart enough to know that she’s not ready for motherhood, and never wavers in her desire to have an abortion. That’s not to say that she’s callous about it: Donna understands that she’s making a big decision, and she eventually has a conversation with her mother about it. Mom knows what life was like before Roe vs. Wade. It’s the opposite with Donna. We’re talking about a young woman who has grown up with abortion and accepts it — although she probably never thought she’d find herself in a position where she needed one. Meanwhile, Lacy’s Max persists in his pursuit of Donna. He doesn’t know she’s pregnant, and sees a possibility for a deeper relationship. There’s not much supporting cast here. Gaby Hoffmann has a nice turn as Donna’s best friend; and Gabe Leiderman plays a gay comic who’s also one of Donna’s pals. 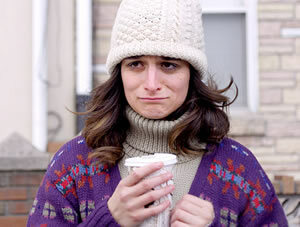 Obvious Child is bound to connect with lots of young women: For me, the movie would have worked better had Donna been something other than mediocre stand-up comic. Many of her routines are sprinkled, Louie-like throughout the movie, a ploy that, for me, just didn’t work. Obvious Child does, however, lower the volume of talk about abortion, allowing a female character to treat it as a part of life — not a happy one, but one that is not necessarily ruinous or soul-shattering, either. That statement deserved a more substantial movie.